Every now and then when I’m shopping online, I get so tempted by books on creativity, and then I go nuts. 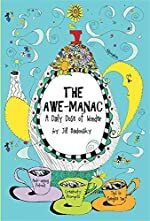 The other day was one such day, and the end result was a mailbox filled with some really fun books, including this one: The Awe-Manac, by Jill Badonsky. Welcome to The Awe-Manac – a playfully practical guide that’s a refreshing twist on the revered Old Farmer’s Almanac. Here you’ll find daily forecasts and directives to help make life more creative, amusing, gratifying, and extraordinary – every day of the year! Through 365 days, you’ll be inspired to think more brilliantly, laugh more often, ignite your creative passion, and simply create a lot more “awe” into daily life. Brimming with colorful, whimsical art and filled with delightful features like “Soul Vitamins”, “Toast of the Day”, and “Doses of Mirth”, The Awe-Manac treats every day as a source of celebration and inspiration. With the “Aha-phrodisiacs” you’ll be invited to write, doodle, daydream, and discover that spark of creativity and wonder that may be lying dormant. It’s an enchanting, sometimes irreverent, daily “companion” – a perennial guide for finding joy and amusement all-year round. I just love that. And of course, today’s quote just happens to be from Goethe (he of the "Whatever you can do, or dream you can, begin it. Boldness has genius, power, and magic in it." fame), because Johann Wolfgang von Goethe was born on August 28, 1749. This entry was posted in Incoming! and tagged Creativity, nonfiction on August 28, 2009 by Belle Wong. Oh my gosh! I love it! What a fun cover, too! .-= Kathy´s last blog ..The Time Traveler’s Wife =-. Doesn’t it look like such fun, Kathy? I’m planning to read it a day at a time, and do (or think about) one thing from each day. I love books like these! I loved Jill Badonsky’s book about the modern day muses, so I’m sure this one if wonderful too. She definitely has come up with some fun concepts for creativity books. .-= Janel´s last blog ..Jumblicious 8/28/09 =-. I have the Muse book, too – it was a lovely read. This one is more in the nature of a Sark book, or a Keri Smith book (Living Out Loud, etc.). Very fun! Fun book for sure. I love the Goethe quote but then I’m all for that sort of thing. I’m the kind of person who pastes those quotes up in various places. .-= Margot´s last blog ..Lost in Austen or Inside Austen (UK) =-. I don’t know this author. Sounds like a good one to get to know! .-= rhapsodyinbooks´s last blog ..August 28, 1963 – Martin Luther King, Jr. Delivers His “I Have A Dream” Speech =-. .-= Serena (Savvy Verse & Wit)´s last blog ..10th Virtual Poetry Circle =-. I’m just having fun googling myself. Thanks for mentioning The Awe-manac, Ms. Belle.